Service as a WIN-WIN: Google Love: Worth the price of flowers and candy? Google Love: Worth the price of flowers and candy? Yesterday I got a call from someone offering to “put me on the first page of Google.” It was a sure thing. In this age of search engine marketing and powerful “pull marketing” tools, that sounded like a free dinner and show all in one! But when I learned more about the process and the true cost, I had second thoughts. And you should, too. Getting found on search engines – or more importantly, getting your listing on the first page of the search results – used to be a matter of great mystery. Some argued it was about the number of websites that have linked to yours with the belief that the more the better and the higher your site appeared in the results. Others believed that Google primacy reflected the frequency of updating while still others pointed to the metadata—the keywords and other “tags” that are part of your Web pages but not visible to your viewers. It turns out that the true story is more complicated but nonetheless understandable. What is your Vision of "Google Love"? Steven Covey had the right idea: it is important to begin with your endpoint in mind. If you could have Google Love, what would it look like to your business? Do you want people to be able to type in your business name and bring up your website, or at least make sure that your site is on the first page of search results? New Google tools, like Google Places, make it possible to assure that your business listing, often with a map link, finds its way to your customers’ 1st page search screens when they look for it with full name and city info. Look what happens when I run that search on Google. My string key words delivered 64,000 listings, which is why being on the first page of a search result is so critical. As you can see, I am not listed on the first page. Well if there are so many sites and digital properties with these key words or phrases, how do the search engines determine what gets listed first, second, etc. The Holy Grail of Search Engine marketing is to figure out how search engines determine placement on their results. Not surprisingly, the effort to discover the answer has driven considerable investment, speculation, and hand wringing. We’ll come back to that in a minute. Now, if I add a location (city) key word to my search string, and a descriptor phrase, I get new results, but, unfortunately, my name still fails to appear on the first page (bummer!). But look at these results that appear on the top of the search results and on the far right hand side of the page. These listings are sponsored search results. 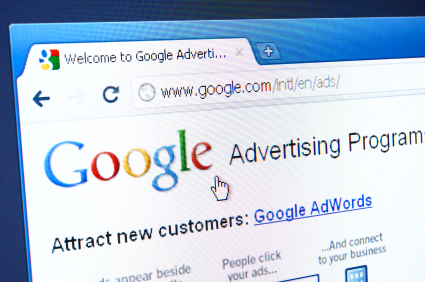 Google has received a fee to display those listings in response to your search request. 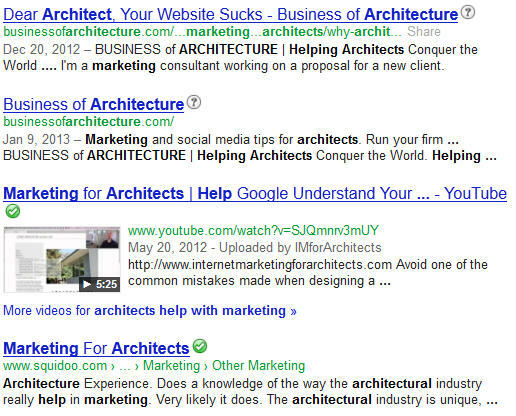 For example, the firms called, Architect Marketing and Moire Marketing Partners have paid Google a market price to be included in this premium position in the search results done with these specific key words. So there are two approaches to key word search success: you can pay for key words—a tool allows you to bid in an auction on for the key words you want, or you can improve your ranking organically by signaling to Google that you deserve a higher placement in the search results. So how do you make this clear to Google? Essentially, by designing content that meets the needs of your readers AND is easily indexed by the search engines.You do this by enlarging your digital footprint, e.g., by adding a YouTube Channel, blog, business Facebook page, etc. Even websites like Slideshare, LinkedIN and Pinterest can help you enlarge your presence on the web. Savvy coordination of your content—e.g., running similar topics written with keywords in mind simultaneously on all your sites and maintaining a high frequency of new content (at least weekly)—will raise your rankings over time. That means your citation will appear higher in the list presented as search engine results. By the way, if you're not sure how well you are doing in this area, go here for a free aanalysis of your businesses digital footprint, and some suggestions for making it larger and a more effective attractor of "Google Love." If you don't want to wait for this slow process of placement improvement it is possible to take steps to "force" your listing into a better placement position. The whole science of Search Engine Optimization (Which is the Holy Grail we mentioned earlier) is devoted to the balancing act necessary to attain and maintain a favorable position in the search results generated by your most powerful key words. Unfortunately any changes you make today do not have permanent effect. The WEB is a dynamic system. . At any moment, you could drop in the standings (maybe even be pushed off the first page) by a change that some other business owner makes on his site. So once you figure out how to obtain a desirable ranking, you will need to continue investing time and money to keep it. As I contemplated the offer I received—“guaranteed first-page Google placement”—and calculated the cost, even for a 3-month trial, I was less sanguine about going forward. To educate myself about costs and benefits, I did some reading, and talked to SEO experts and businesses that spent large parts of the buz dev budget on SEO. Here is the essence of what I learned. “YouTube is the 2nd-largest search engine on the web, and it can help get you significant ranking if tagged right. You need to post new content weekly to get the best results,” says my friend, Randy Steyer, an expert with years of experience in search marketing and search advertising. I’m not closing the door on expensive SEO. It might be right for some of my clients with specialized needs. And making sure my business and those of my clients are listed in Google Places seems like a safe bet to meet the needs of their customers. But for now I am going to be pursuing "Google Love" by creating lots of content relevant to my market, tagging it properly, and crafting my content to include frequent usage of the specific key words that I know that my prospects will be using to search for firms like mine. I will be pushing it out to social media sites, my blogs and YouTube. I'm recommending my clients do the same. It may not be a "sure thing" but it is a safe play that will prove its worth over time. I’ll save the flowers and candy for my sweetie. I have used Google Adwords twice over the past seven years. The first time it worked well, but mainly due to repeat business from the attracted clients. The second time, around 2008, it bombed. I specifically let the Google people design the campaign so that I could eliminate any variable of something I might have done wrong. They used staffers in India to design the campaign, which immediately made me suspicious as to their training and capabilities. In addition, the per-word price had risen substantially and became cost-prohibitive. In short, this is a great way for Google to make money and drain your wallet. I've had better results with pure SEO and rising to the top of keyword rankings. I completely agree with you that "Content is Kind and Frequency is Queen and it's nice to have a BIG family." Too many business owners slap up a website, write a blog and then wonder why no one notices. Having lots of content and posting it often will make a difference that will yield results--thanks for the reminder! I have a sore neck – too much nodding as I read Mark’s latest blog about the “failures of Key Word Research”, as an optimizing technique frequently used for getting more web traffic. I think what he says makes a lot of sense. What about you?